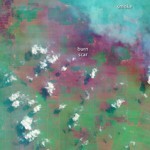 In June, air pollution over Singapore and Malaysia spiked as forests in neighboring Sumatra (Indonesia) burned. Using NASA’s daily fire alerts and official national maps, the fires were located in the vicinity of oil palm and acacia tree plantations. However, the coarse resolution of the fire alerts coupled with outdated national maps, made it hard to establish culpability.